On May 21st, 2013, The Mickey Mouse Clubhouse: The Quest for the Crystal Mickey became available on DVD. This includes five exciting episodes. The boys loved each and every one even though they had already seen them each on the TV! 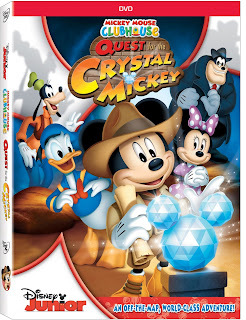 Dane claims this is one of his favorites because of all the action through The Quest for Crystal Mickey. There’s no time to lose after greedy Plunderin’ Pete snatches the legendary Crystal Mickey statue from the Clubhouse. Without this sparkly statue’s magic, the Clubhouse will disappear forever! Can the world’s most extraordinary hero 'Kansas City Mickey,' get the magical statue back in time? Only with help from young viewers at home…and the right Mouseketools can Mickey journey across the Sandy Desert, brave the Rushing River and make his way through the Hidden Jungle. But watch out for Pete’s trickiest traps!"